Want more distance? You have to step on the gas. Callaway and Lamborghini (the Italian car company) have teamed up to bring you the strongest, lightest, most precise material ever used in a golf club. It's a forged composite. The material is lighter then titanium (the material used to make 95% of all drivers today). This is good news for all golfers but especially the ladies, who are already using lighter, stronger materials to boost their performance. I would never advise anybody to try and swing harder to get more distance, but obviously with lighter material, your natural swing will produce more clubhead speed. 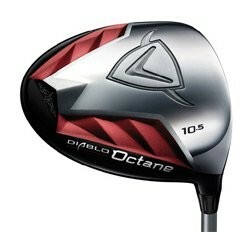 In addition, I like the huge clubface with the toe of the driver being very obvious. This will definitely help you slicers. The graphics of the club are pretty cool as well -- made with a window on the crown. You can actually see the new forged composite material. I also love the sound at impact. Most carbon fiber clubs are pretty muted, but this has a very pleasing impact sound, even when you don't catch it square in the middle of the clubface. I'd recommend this club to all ladies, but especially to those of you that are looking to get more distance and forgiveness without trying to swing harder.